Please contact us to find out about our Big Group Discount prices – we can offer 10% or more depending on your group size! Wild Tree Adventures are perfect for family & friends,?birthday parties, groups and schools,?and they are a great way to make the day memorable. ?Tree climbing is a great way to explore the natural world while at the same time getting great exercise so come explore the wonderful wild woods from a fabulous new viewpoint up high in the canopy of a tremendous tree! Everyone from 6yrs+ can have a Wild Tree Adventure! Please note that your child must have had their sixth birthday as this is an explicit requirement of our insurance. No experience or skill are required, just a moderate level of fitness and an adventurous spirit. Each participant will be fitted with a safety harness and helmet, given a short demonstration and then connected securely to our climbing system. They are then free to climb as high as they like making sure to take in the view, dreamy atmosphere and remember to have lots of fun! 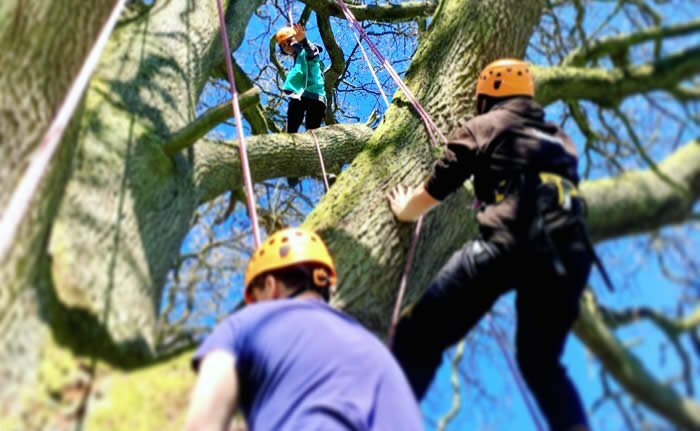 Tree climbing adventures help bring children closer to nature, encouraging an exploration of the natural world whilst learning to make measured and calculated risks. This is altogether a great learning experience and something unique to experience. Parents, carers and guardians can enter the climbing zone (whilst of course staying firmly on the ground) to give Extra Assistance and additional supervision where required. We offer our skills and attention however, if 1:1 dedicated time is required then it may be necessary to book out an entire timeslot. Please contact us before booking your tickets to discuss this further.
? All safety equipment must be able to be able to be correctly and safely fitted to the participant.
? All participants under the age of 18 years must have the explicit permission of their parent or legal guardian before being able to take part in activities with Wild Tree Adventures. The parent or legal guardian needs to be aware and sign to accept the risks involved in tree climbing and satisfy themselves accordingly. AN ADVENTURE PARTY TO REMEMBER! For a birthday party to remember why not go on a Wild Tree Adventure with your friends! Wild Tree Adventuring is a great fun and full of fabulous challenges, for all ages from 6+. You can book out an entire hour slot at one of our events if you would like your birthday party to be completely private or we may be able to use a location near you to run your own private event. Contact Us for more information and to discuss possible locations for your event. For an extra special party in the privacy of your own grounds let us organise a tailored party for you. All you need is to have access to a large, healthy tree and to tell us the date of the party, the number and age of participants, your location, and if you can please send us some photos of your tree. We will carry out a thorough inspection of your tree free of charge prior to any event. Please contact us before booking your tickets to discuss this further on 0800 6226465 or via our contact form so that we can provide a quote dependent on your needs. Let us take you on Wild Tree Adventures for that extra special experience! We welcome bookings from groups including Youth Groups, Stag & Hen Parties, and Corporate events. We will do our best to accommodate your requirements. You can book out an entire hour slot at one of our events. We may also be able to run a private event at a location near you and we will build a bespoke package to suit your needs at very reasonable prices. Contact us for more information and to discuss possible locations for your event. Please note that you cannot drink alcohol before or during any climbing. 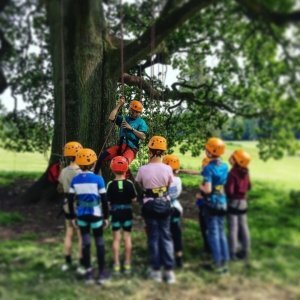 Wild Tree Adventures believes that children can safely challenge themselves, providing a great way to build important life skills such as teamwork and overcoming fear as well as having enormous fun adventuring in the tree! Our Wild Tree Adventures are a wonderfully rewarding activity for school groups, suitable for all Key Stages. Participants can be rewarded with a certificate.. Teaching in the trees can be used in a variety of ways – as part of your curriculum, for activity days, sports days, open days, post exam celebrations etc and we work independently with little or no input required from your staff, we work in sensitive sites with minimal environmental impact and we supply everything. Our staff are all highly skilled and qualified and they are also PVG scheme members and First Aid trained. All you need is a suitable tree!